The incident gained an international spotlight this week after a Melbourne, Australia-based website published an account that portrayed the shooting as a deliberate attempt to target firefighters and erroneously reported that the FBI had sought charges against the hunters. 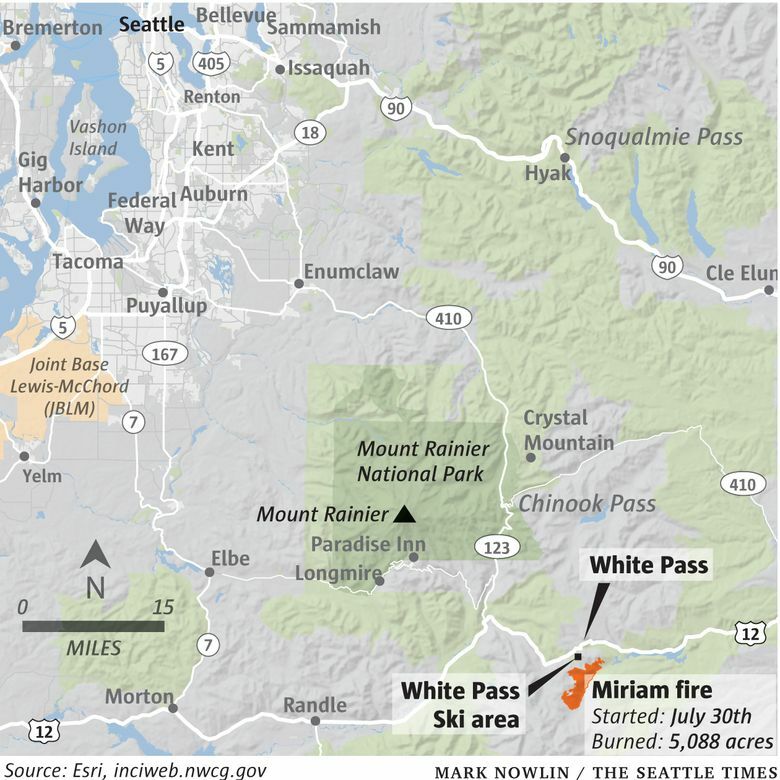 Federal authorities say two hunters were cited last month after they entered a closed area and fired their rifles in the direction of firefighters who were battling a wildfire near White Pass Ski Area. Firefighting in the area was temporarily halted once gunfire was detected on the afternoon of Aug. 23, and 14 U.S. and Australian firefighters were evacuated to the nearby ski lodge. No one was injured, but there were some tense moments when firefighting teams initially thought that there might be an active shooter. The incident gained an international spotlight earlier this week as the Melbourne, Australia-based The Age published an account that portrayed the incident as a deliberate attempt to target firefighters and erroneously reported that the FBI had pressed charges against the hunters. U.S. Forest Service spokeswoman Traci Weaver said Monday that there was no evidence of malicious intent by the hunters, but that they were cited for being in an area that had been closed due to fire. At around 1:30 p.m, firefighters heard what some thought was a gunshot and others thought might have been an explosion or a tree breaking, according to a report on the incident by the Pacific Northwest Risk Management Team. About an hour and half later, firefighters spotted two people about 200 yards below them. The firefighters stood up and started to shout, and thought they had made their location clear, according to the report. But then they watched through binoculars as one of the individuals put a scoped rifle on a bi-pod and appeared to look up at the mountain toward them, the report said. The firefighters continued to wave – but a shot was fired, prompting them to flee from the backside of the mountain. More shots were fired. Then, firefighters were evacuated by helicopters and concerns about the shooter prompted a lockdown at the ski lodge that served as the fire’s incident command post, according to the report. The incident was investigated by Yakima County sheriff’s deputies, who found a vehicle on Highway 12 near where the shots were fired, ran license plates and contacted the hunters that same day. Weaver says federal law-enforcement officials investigated the hunters, who said they were shooting ground squirrels and marmots and also were bear hunting. She said that the investigation is ongoing. Weaver says she checked with the National Interagency Fire Center, which coordinates international teams’ response to U.S. fires, and officials there were not aware of any demands from Australia to upgrade security.